Welcome to the Carmel Retreat Center! 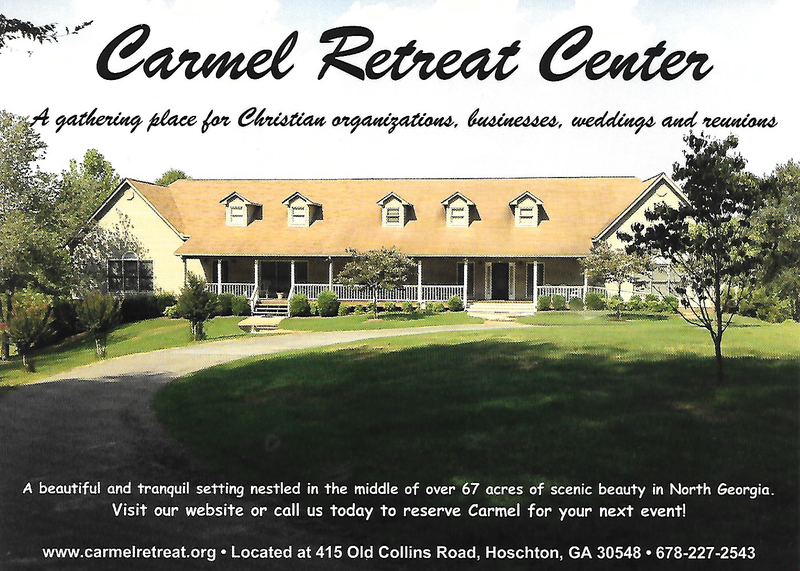 Situated on 65 acres of pristine woodlands, this beautiful spiritual retreat center is located 45 miles north of metro Atlanta. We serve the Christian community in the metro Atlanta, Athens, Winder and Gainesville areas. Whatever your needs; weddings, church meetings, family gatherings, or that special pastoral spiritual retreat, we have the facilities for you. Everything is here, from full kitchen and sleeping facilities to spacious meeting rooms and a chapel. Outdoors you will find beautiful grounds with recreation areas for small gatherings and several gardens for quiet study times, counseling, and contemplation. Carmel Retreat also has acres of beautiful woodlands and a nature trail for long quiet walks and exploration. Whether your event is for just a day or an entire week, let us help you and your family or church group enjoy an occasion in a distinctive retreat setting that will bring cherished memories for years to come. Contact us for Retreat Information.